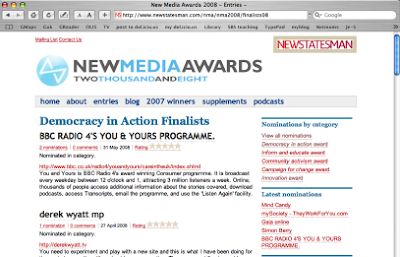 An online citizenship project I helped develop and design has been shortlisted for a new media award by the New Statesman magazine. Developed in 2005 in collaboration with Barby Asante, George Grinsted and Rachel Collinson, the World Power League was conceived of as a tool for young people to play with ideas of leadership: who has power, who does not and why. Using what I call a "throwaway" interaction rather like the website amihotornot, the website offers an apparently simple choice between two types of leader with possibly different types of power - say, Nelson Mandela and Madonna. The user picks the one who in his or her opinion should have more power. The aggregrated results from all users are shown in a visual table - the power league - which can be used to organise conversations in school about power and responsibility. Artist Barby Asante and I originally worked with Year 10 students from a school in northwest London to develop insights into how young people understand democracy and leadership. Then together with software developer George Grinsted and interface designer Rachel Collinson of Rechord, we conceived of the World Power League as a playful but also serious way of engaging with issues of power. This project, from concept to prototype, was supported by what was then called NESTA Futurelab. The World Power League has since been further invested in and developed by Futurelab as Powerleague since the original team did not have the resources to take it forward at the time. The winners are announced next week. This exhibition might be seen as a form of public experiment. Organised to accompany the first workshop on "Imagining Business: Reflecting on the Visual Power of Management, Organising and Governing Practices" (see link above), the exhibition provides another way to explore the complexities of visuality in organisations, as well as the specific and localised activity of visualisation. A series of questions animate both the exhibition and the workshop. How do visualisations constitute organisations? How might our understanding of business change if we thought of the artefacts of business as themselves performing? Do we need to develop dedicated theoretical orientations towards the power of the visual as enacted in day-to-day organisational life? What are the potentials for the artefact, whether diagram, object or some other form entirely, to disrupt the normative ways in which business operates? A catalogue is available with essays by Paolo Quattrone, François-Régis Puyou and Christine Mclean; Jon Wood; and an interview by Noortje Marres with Lucy Kimbell and Nina Wakeford. Catalogue intro by Alex Hodby, Lucy Kimbell and Nina Wakeford. For more information please contact curator Alex Hodby at Platform Projects. Funded by Goldsmiths College, the University of Oxford, ESRC, Oxford University Press John Fell Fund and supported by the European Institute for Advanced Studies in Management (EIASM).